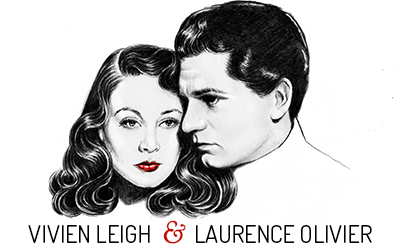 The recent Criterion restoration of Gabriel Pascal’s 1945 epic Caesar and Cleopatra starring Vivien Leigh and Claude Raines, and based on the play by George Bernard Shaw, reminded me of another buried treasure in my Vivien Leigh/Laurence Olivier collection. 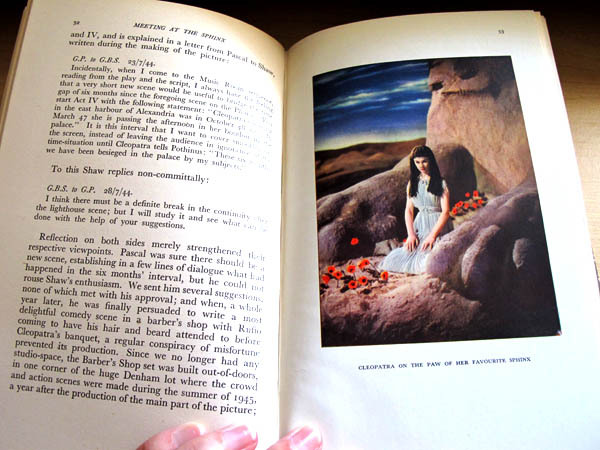 Meeting at the Sphinx by Marjorie Deans is a book that was published in 1946 as a supplement to Pascal’s film. We see a lot of these types of film books today, and I’m not sure how common it was for them to be published for classic films, but I think this one is fairly rare. I got it for quite a steal on ebay a couple years ago. Marjorie Deans was the script supervisor on the film, which lends credit to her placing herself in the narrative of the book. She talks of Vivien Leigh and Claude Raines behind the scenes, and how their personalities effected their characters (nothing negative, of course!). 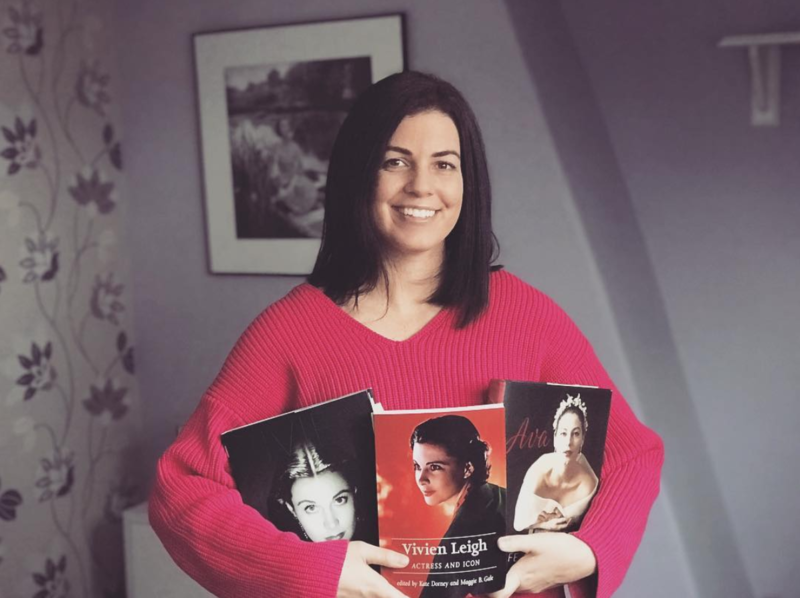 She also talks about the difficulties of making the film: air raids happened often, bombs were dropped quite close to Denham Studios, Vivien Leigh fell on the set and had a miscarriage (not mentioned in the book, only that she fell ill for six weeks), among other setbacks. Luckily for director Gabriel Pascal, the film was backed by producer J. Arthur Rank, who supplied the funds to import real Egyptian sand, to build such lavish sets, and to drag out the shooting schedule. My favorite parts of this book are the amazingly vibrant Kodachrome plates by Wilfred Newton, the still photographer on the film (Cecil Beaton did the publicity portraits). They almost look like paintings. Sadly, the film itself failed to live up to its hype and was considered a failure. 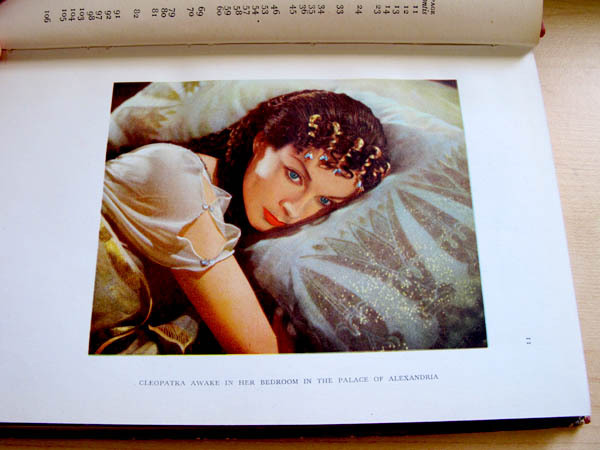 Due to the pain of her personal loss, Vivien, who had wanted the part of Cleopatra as she had wanted the part of Scarlett O’Hara, would not see the film until the early 1950s. Despite not being a huge fan of the film, I think Meeting at the Sphinx is quite a gem because we get the inside story on what was then the most expensive and lavish British film ever made. What a great blog post and that book is such an amazing keepsake. I love Oliver Messel’s costumes for the film. He did the costumes the “Pinewood” Elizabeth Taylor Cleopatra, but the costumes were re-done by Irene Sharaff when the production resumed in Rome. It’s a shame, his designs were lovely. How does the Criterion restoration look? I’m not a big fan of the film either, but it sure is beautiful. Wow, that is quite the “hidden gem” of a book! 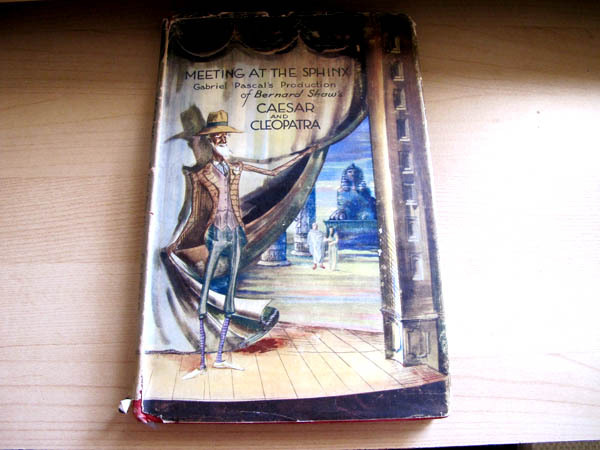 I actually am the rare person who doesn’t think this 1945 “Ceasar and Cleopatra” is a flop! Sure, it is a bit slow in some spots, but once you get used to Shaw’s sly, arch wit — at least in its rewritten form here, since I don’t think he wrote this screenplay — you can see that it is a very clever story. 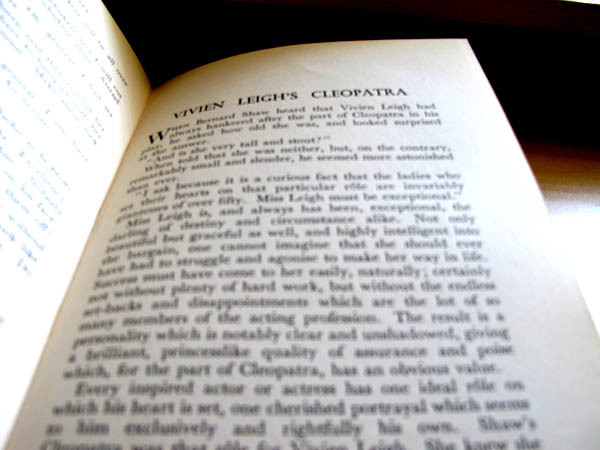 The relationship between Cleopatra and Ftetateeta is funny and slightly spooky…..and Flora Robson! It makes me laugh to consider that in “Fire Over England” she played Queen Elizabeth, and Vivien Leigh played a lowly handmaiden….while in this Pascal movie, their roles are reversed, Leigh playing the Queen and Robson her servant! 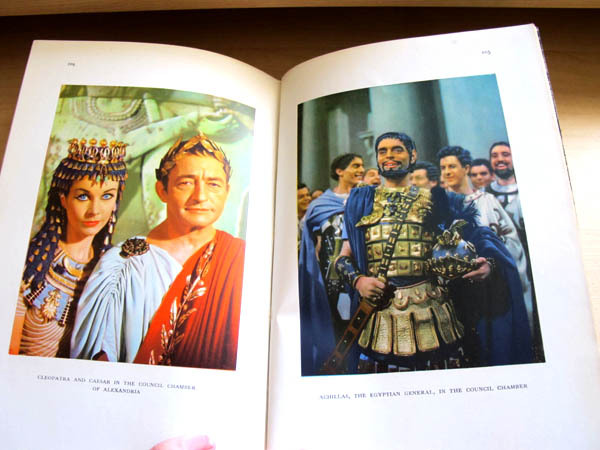 And esthetically, “Ceasar and Cleopatra” is amazing; I recently watched a restored version on TCM, I think, and the colors are simply spectacular! I have a vid of the Criterion release from the ealy 1980s, and the colors in it are very washed out, by comparison. Anyway, thanks for sharing these items, they are fantastic….